I had the chance to present some of my research at the Canadian Association on Gerontology’s annual Scientific Meeting. I’ve been attending this conference for 4+ years, and truly value the connections I’ve made through this organization. It’s so nice to see familiar faces year after year, and recognize all that my peers have accomplished! I was also excited because the conference took place in Niagara Falls Ontario – and enabled me to have a nice visit with my Dad & Cindy (’cause it’s been far too long since I’ve seen them!) and a close friend from University. If you’re interested in reading my abstract – I’ve included it below the pics. Those fall colours, though, were beautiful! much love. Caregivers’ social-identity is tied to that of the care-recipient, and may be undermined in dementia. As such, engaging in meaningful activities may help both caregivers and persons with dementia. This study explores meaningful activity defined by spouse and adult-child dementia caregivers. 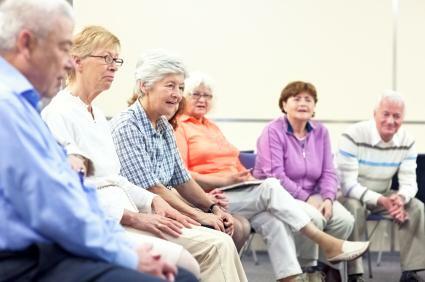 A larger research program recruited caregivers of persons with Alzheimer’s disease, vascular, frontotemporal, and Lewy Body variants taking cholinesterase inhibitors (ChEI). Caregivers provided minimum 3hours of care over 3 days/week. In-person interviews were completed 6-months after ChEI onset. This study compared spousal (n=640) and adult-children (n=265) responses to the open-ended question “What do you believe getting involved in activities outside the home means for someone with dementia?”. The answers were transcribed and phenomenological thematic content analysis was completed. Spouse caregivers identified meaningful activities as beneficial to the couple, including: social engagements as a couple, broadening both persons lifestyle, maintaining interrelationships with others, and sense of social normalcy. Spouse caregivers related activity participation to self-worth. Spouses provided care in earlier stages, where care-recipients may be more aware of dementia symptoms. Increased social anxiety, frustration and embarrassment in public were reported. Adult-children caregivers identified meaningful activities as interaction with peers. For adult-children, meaningful activities included opportunities for parents to relate to their peers, companionship, and independence. Adult-children provided care in later stages, where participation in activities alleviated reliance on the caregiver and enabled personal-time and breaks from care duties. Caregivers’ views on meaningful activity differed depending on their relationship. This new knowledge may indicate areas for improved activity provision and support. Can aging really be cured? kaitlynroland October 21, 2014 No Comments on Can aging really be cured? Have you seen the October cover of The Atlantic? Gregg Easterbrook discusses how society will change if life-expectancy trends continue (umm, meaning if we all continue to live longer!). Life expectancy is currently 83 years in Canada, and if the trend continues – by the end of the century, it will be 100 years! Longevity research is a hot topic – both private research facilities and public universities are dedicated to studying ways to make organisms live much longer, and with better health, than they naturally would. But are we simply adding time? Or living longer with good vigour? And what are the societal risks that would accompany longer life-span? Politics? Social security? Private pensions? Health care costs? … and this would be exaggerated if the fertility rate continues to decline. If you’re interested in this discussion and the implications of infectious disease, chronic disease, diet, exercise, genetics, the full article can be read HERE. Can aging really be cured? And does the human age have a biological limit? REALLY interesting and relevant. much love. I recently published an article in the journal Ageing & Society addressing the different challenges faced by caregivers across different disease groups. We often send all caregivers who are caring for a loved one with dementia to the same resource (i.e. Alzheimer’s society), when in fact they may be facing very different challenges! After a thorough look at the scientific literature, I developed some classifications based on symptom presentation and disease. This chart below tell us that certain symptoms associated with dementia lead more often to specific caregiver outcomes. For example, challenges with activities of daily living (ADL) lead most often to a greater need for caregiver resources; while depression (“mood”) in persons with dementia effects the relationship with the caregiver. Caregivers of persons with MILD COGNITIVE IMPAIRMENT are most challenged with a “Role Shift”. This means cognitive deterioration results in changing marital roles, communication conflicts, intimacy, isolation & stigma – that greatly impacts caregivers. Caregivers of persons with LEWY BODY DEMENTIA (including Dementia with Lewy Bodies and cognitive impairments associated with Parkinson’s disease) are “Consumed by Caregiving”. This means that caring for someone with dementia combined with motor declines may result in hyper-vigilance around safety, worry & isolation in caregivers – increasing their burden and distress. Finally, caregivers of persons with ALZHEIMER’S DISEASE have greater “Service Use”. AD results in greater ADL dependence & behaviour changes that may result in caregivers need for formal support to cope with functional responsibilities. Since moving to the west coast, surfing has played a (large?) role in my life. What we do on the weekends (tofino, tofino. tofino), where we travel to (“is there an ocean?” “is there surf?”), when we travel (winter storms = best waves). I’ve written about surfing and yoga poses I do here and recently, lessons from learning to surf here. Whether you’re paddling into or just want a stronger core, yoga is a great tool to help increase flexibility, balance, core strength and gain awareness. A strong core (more on that HERE!) is the perfect starting point for surfing, and yoga teaches us to be present, remain calm and to return to our breath again and again no matter what the outside circumstances. Step three feet apart. Turn your toes out 45 degrees and spin your heels in. On an exhale, bend your knees until your thighs are parallel to the ground. Make sure your knees are over the center of your foot. Raise your arms straight ahead to shoulder height, palms facing one another. Cross your right arm on top of the left and bend and hook your elbows. The backs of your hand reach for one another or wrap around your wrists. On an inhale, lift your forearms up a few inches and, on an exhale, reach the forearms away from you, spreading your shoulders on your back. Engage your core by drawing your navel in and up. Inhale, straighten the legs a few inches, exhale, sit deeper as the hips lower toward thigh height. Pulse with breath a few times then slowly free the arms and straighten the legs. Repeat on the other side. Step your feet wide apart and raise your arms up to shoulder height. Turn your right foot out 90 degrees and turn your left foot perpendicular to the right. Inhale, engage your core and exhale bend into the right knee. Your knee should track over the center of your foot. Ground the outer edge of your back foot up the entire leg Bring your right forearm to your thigh and stretch and reach your left arm up to the sky. Lengthen the sides of your body while turning the underbelly of your waist and chest up to the sky. Breathe into the sides of the body and the entire length of your spine. Repeat on the left side. Plank gains strength and stability in your core and shoulders (building power for your pop-ups!). Start on hands and knees, placing your hands directly under your shoulders, spread your fingers apart, grounding all four corners of your palms. Tuck your toes under and lift up behind your knees to straighten your legs. Hips and shoulders should be at the same height. Draw your abdominal wall up to support the entire length of your spine. Your tailbone lengthens in the direction of your heels as your pubic bone moves toward your navel and your navel extends toward your heart. Keep your neck long and breathe. Start on hands and knees and walk your arms forward, lowering your chest and forehead toward the ground. Keep your hips right above your knees. Press into the palms, lift the forearms up off the ground and melt the back of the heart. Lie on your belly and place your hands under your shoulders. Lengthen your buttocks toward your heels and extend and reach through your legs and spread your toes. Press the pelvis down and lift your hands, chest and feet off the ground. Lift with the whole of the spine and keep the legs active and strong. Keep space in your lower back (no compressing or jamming!). Cristi Christensen, co-founder of Yoga Surf Camp, a 180-minute workshop that combines beachfront yoga with surf lessons at Exhale Center for Sacred Movement in Venice, Calif. Ever since moving to the west coast, I pictured myself wave sliding. Nose riding on a perfect day. Sliding across the face of a wave; dancing gracefully up and down my board with the wind in my hair. I’m proud that I’ve stuck with it, I’m still learning, AND having fun. I’m gained so many things from the ocean… new knowledge about moon, tides, shifting sand banks, a reinforced love of travel. I’ve learned to stop psyching myself out of a situation because of what could happen. Sitting in the line-up on my board makes my mind wander to “sharks” “rogue waves” “what if I can’t get in” “rip tides” “falling on reef”. All these thoughts are just created by my own ego. And although some of these things CAN happen, it doesn’t mean I need to create all these scary scenarios in this moment. Surfing’s also taught me not to be afraid to fail (and fall!). Failing (and falling) gives us the opportunity to try again, with a bit more knowledge. Learning something new also gives you the opportunity to have a “beginner mind“, without all those ingrained patterns of knowing and bad habits. Back to the basics. One skill at a time. For me, I started with being comfortable on my board in the line up – I would sit out on the shoulder for entire sessions watching the waves; learning to manage my board and how get out of the way. Then (over a year later!) I started paddling for waves, learning to catch them on my belly. And now, I’m working on popping up once I’ve caught it. And, guess what? Even Kelly Slater had to start somewhere (maybe it was 40 years ago…). There will always be little groms out there surfing circles around me, but we’re still on the same journey. Surfing is fun for the fun of floating in the ocean on a giant piece of fiberglass and foam. Everything else is a bonus. Those occasional wave ride helps, so do beautiful sunset surf sessions, but sometimes failed take offs and nose dives are just as exhilarating. So, if you see me out there, cheer me on as I paddle my hardest into a 2ft ankle buster. I’ll be the girl in the lineup with the smile on her face and the most embarrassing wipeouts. much love. Mark your calendars, I’m doing a Yogadopa for Parkinson’s workshop in conjunction with the lovely folks at Oceanside Yoga studio in Parksville BC on Oct 4th. The class is open to persons with PD, care partners and other health/fitness professionals who work with persons with PD. Please contact Oceanside Yoga at 250.594.0108 or info@oceansideyoga.com for more information or to register… space is limited! Can’t wait to see you there 🙂 much love. When many people think about a strong core, they picture someone with “six pack abs”. But our functional core is actually much more complex than this over simpliﬁed notion, and whether your abdominals are super deﬁned and underwear model-worthy or not says nothing about how strong your core truly is. Rectus abdominus, or “six-pack”, muscle is actually just the most superﬁcial (closest to the skin) of our four abdominal muscles. It runs vertically along the front of the abdomen and when it contracts, it pulls the rib cage and pelvis toward each other, usually resulting in a rounded spine (spinal ﬂexion) and/or a tucked pelvis (posterior tilt). These six-pack abs don’t actually offer any physiological benefits. Learning to wean ourselves off of the over-use of the six-pack muscle is therefore an essential step toward restoring balance in our body. Our other three abdominals are deeper: the internal and external obliques run diagonally across the abdomen and are commonly thought of as muscles that rotate the torso. 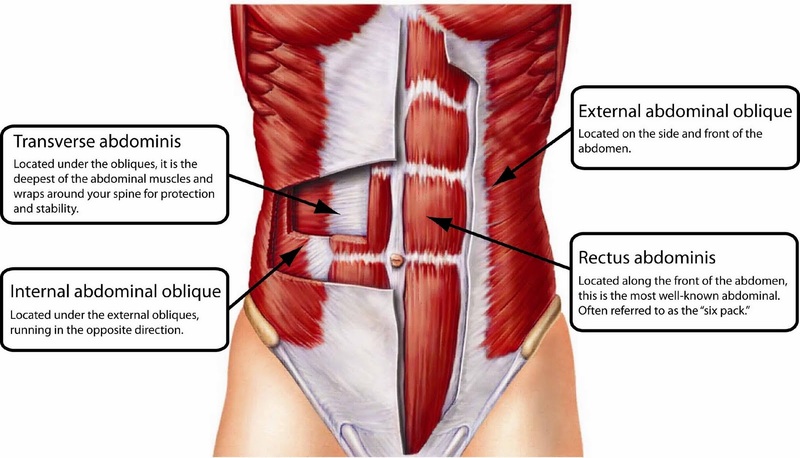 The transverse abdominus is our deepest abdominal of all, and when it contracts, it has a corset-like effect of compressing the entire abdomen inward. These muscles keep your spine stable and protected as you twist, squat, climb, bend over, lift heavy objects, and generally move your way through life. If the pelvis tucks, it uses only our six pack muscles and causes our low back to ﬂatten (hypolordosis)… these natural spinal curves are actually crucial to our spine’s optimal functioning (our built-in shock-absorbers). Thus, we want to preserve these natural curves and therefore the integrity of our structure by stabilizing our spine. HOWEVER, there are some instances in which we do want to work a posterior pelvic tilt (aka. tuck). But the idea that we should tuck our pelvis indiscriminately throughout our yoga practice to create core stability is outdated and biomechanically incorrect. hope this provides a better understanding of how our entire core works together to stabilize our spine. much love. Alzheimer’s disease is the largest component of dementia, but only a component – Parkinson’s disease can also be a source of dementia. In Parkinson’s disease, cognitive issues include more personality, emotions, interaction with others and mood (anxiety, depression) rather than memory issues. And this affects family members. Family caregivers stress the difficulty in managing age-related issues, dementia, Parkinson’s disease, and medication management… Parkinson’s dosage can be up to every 2hours and include more than 45 pills per day! The obsessive behaviours are more stressful than the toileting and dressing difficulties. caregiving in someone with Parkinson’s + dementia is a “double whammy”: physical exhaustion (dressing, toiling) and mental exhaustion (from worry about dementia)… physical part easier than mental to caregiver! Although there is a great deal of sadness, caregivers reflect on the many years of happiness – and cope by taking things one day at a time, one solution at a time. healthcare professionals need to consider: what the person knows about they diagnosis? what are their needs and what needs to be happen for them to be met? what is their current situation? how is the diagnosis received? do they have a loved one(s)? what is the impact on personal, family, work? how is the person with dementia/caregiver coping? who is included in circle of care? who do they want to share diagnosis with? Healthcare professionals should reframe the current situation as “life beyond dementia” – what is important to person with dementia? what are their plans for the future? what are some lifestyle changes that can help them live life to the fullest of their abilities (adapted exercise program)? access to hop in emergency situation? Thanks for a great informative session CIHR, and I appreciate the awareness of the issues faced by persons living with Parkinson’s + dementia! CIHR also released a great YouTube video on a family’s perspective on dealing with dementia. Watch it below! much love. … thought I’d share some pics of how my summer went (… it was a pretty great one at that!). Hope you enjoyed everything that summer brought! much love.